At 12:15 GEFD was dispatched to a reported structure fire at 1972 Arlington rd. 1215, 1221, 1228 and 1214 responded with 9 under the command of Capt. Curtis Stallings (Radio #1201). 1215 arrived on scene and reported a working kitchen fire and requested an additional tanker to respond to the scene and for an engine to set up a fill site at a nearby lake. 1218 and 1223 responded with 5 called back "C" shift firefighters. 1215's crew preformed fire attack while 1214 acted as the supply engine. 1221 acted as RIT. 1228 and 1218 acted as a tanker shuttle. 1223 set up a fill site at a nearby dry hydrant near the lake. The fire was extinguished with minimal damage to the house. The cause was determined to be a leaking gas pipe that fed the stove. All units were clear of the scene by 14:58. At 16:38 GEFD was dispatched to a tree fire near the residence of 1677 Hamilton ct. Mini-pumper 1224 and utility 1226 responded with 3 under the command of Lt. Robin Costell (radio #1207). Upon arrival 1224 reported a working tree fire with extention to the lawn of the residence. 1224's crew pulled their reel line and began to wash down the yard. 1207 arrived and requested a tanker to the scene for water supply. 1218 responded with 3 under Captain Curtis Stallings (radio #1201). 1218 arrived and was directed to pull 200' of 1" brush line to attack the fire that was closing in on the house. The fire was extinguished by 17:07 and all units were in service by 17:15. At 11:42 GEFD was dispatched to a car fire on State Rt. 343 between the 73.2 and 73.4 mile markers. 1224 (retired) and 1218 responded with 6 personnel under the command of Captain Kyle McGee (Radio #1203). Upon arrival 1203 reported a working car fire and that the driver had self-extricated. 1224's crew pulled a 1 3/4" attack line and began attacking the fire. 1218 arrived shortly after 1224 and supplied them with a 5" supply line. All units were clear of the scene by 12:20. At 11:09 (during the same time-frame as the structure fire), GEFD was dispatched to a single car rollover MVA on State Rt. 343 at the 63.2 mile marker. 1217 and 1221 responded with a callback crew of 5. 1217 arrived and reported a single car MVA with heavy damage, the remains of the vehicle were on fire, and the sole occupant had been ejected. 1221 arrived and began patient care while 1217 extinguished the fire. The driver of the car was transported to Heartland Trauma Center with severe spinal and neck injuries. The call was cleared at 11:48. At 9:26 GEFD was dispatched to a working structure fire at 4023 Chancellor Drive. 1223, 1228, 1212, 1216, 1226, 1200, and 1215 responded with 13 personnel under the command of Chief Jonathan Ness (Radio #1200). 1223 was first due and confirmed a working structure fire. 1228 and 1200 arrived at the same time. 1228 tied into 1223 and 1200 was positioned as the command post. 1212 and 1226 were sent to stage and wait for any medical emergencies on the scene. 1200 requested a general alarm for station fill and for the aerial to respond to the scene. 1219 responded with 2. 1219, 1216, and 1215 arrived near the same time. 1215's crew pulled a secondary attack line, Capt. Curtis Stallings (Radio #1201) reported to command as the safety officer. 1219's crew was assigned to ventilate the building. The fire was extinguished quickly but caused extensive damage to the kitchen and front hallway of the home. All units were clear of the scene by 12:53. At 14:32 GEFD was dispatched to a car fire with exposures at 5924 Arlington Court. 1223, 1215, and 1200 responded with 6 under the command of Chief William Black (Radio #1200). 1223 arrived and reported a working car fire in the driveway of the residence. 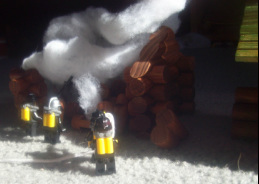 Their crew pulled a 1 3/4" attack line and began extinguishing the fire. 1215 and 1200 responded from station 1 and positioned to block traffic. 1215's crew entered the house to check for extension. None was found and all units were clear of the scene by 15:45. At 14:52 GEFD was dispatched to a working structure fire at 9351 E. Deer Park Road. 1213, 1228, 1226, 1223 and 1200 responded with 9 under the command of Chief William Black (Radio #1200) as well as a mutual aid pumper-tanker from Brickfield (2318). Upon arrival, 1213 reported a working structure fire in an unfinished house and called for an aerial to respond. 1213's crew pulled a line and made entry into the structure. 1228 arrived and its crew pulled a second line and began to attempt to extinguish the fire from the outside. 1233 arrived and acted as RIT. 1226 and 1200 arrived and 1200 assumed Deer Park command. 1219 arrived and tied the hydrant at E. Deer Park and Fountain View Road. 1219's crew began to extinguish the fire with an aerial master stream. The fire was extinguished at 15:47 and all units were clear of the scene by 16:25. The cause of the fire is under investigation. At 12:32 GEFD was dispatched to a single car rollover at the intersection of State Route 343 and Garinger Road. 1233 and 1212 responded with 4 under the command of Sgt. Josh McGowan (Radio #1208). Upon arrival, 1208 reported a single car rollover with heavy damage, and that the lone occupant had been ejected from the vehicle. 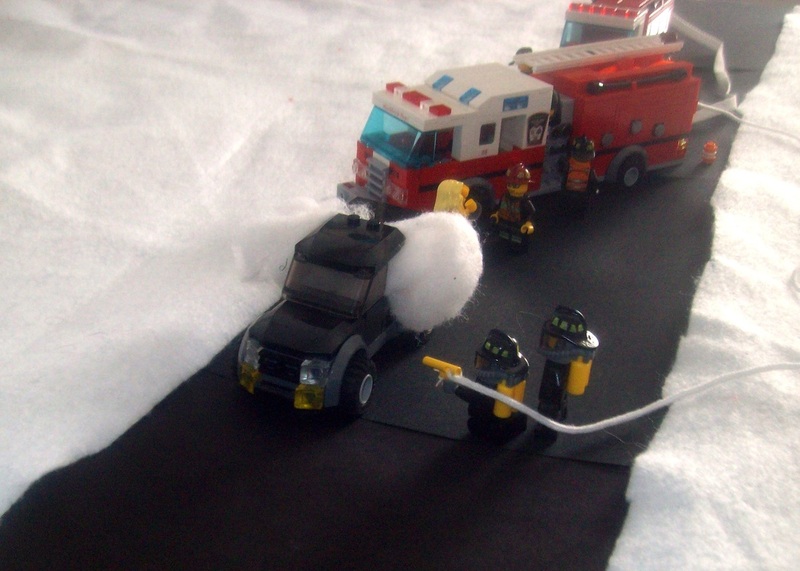 1233's crew began patient treatment and awaited 1212's arrival. 1212 arrived at 12:44 and took over patient treatment. The patient was transported to Heartland Trauma Center where he is in critical condition with head and neck injuries. The call was cleared at 13:37. At 11:42 GEFD was dispatched to a working structure fire at 10421 Spangler Road with unknown entrapments. 1213, 1212, 1223 and 1216 responded with the duty crew of 8 as well as Chief William Black (Radio #1200). 1213 arrived and confirmed a working structure fire, which brought a general alarm for manpower to the scene as the rest of a first alarm assignment. While the rest of the alarm responded, 1213's crew advanced a line into the structure to begin the primary search. 1223 was assigned to RIT and 1212 was assigned to stage on the North side of the street. 1219 arrived on scene and raised their aerial over the roof to try to blanket the fire from the top (as the building's roof hadn't been constructed yet). 1214 and 1233 arrived shortly after. 1233 tied into 1219 to supply the aerial. 1216's crew pulled a 2nd line from 1213 into the structure to assist. 1213's crew located a victim in the B/C corner of the structure. 1216's crew arrived and assisted in the removal of the victim. However, the victim was DOA. The fire was fully extinguished by 13:07. At 19:37 GEFD was dispatched to a shooting in the alley between 174 and 176 Granford Avenue. 1212, 1221 and 1226 responded with 5 under the command of Chief William Black (Radio #1200). Upon arrival, 1212 reported a male with a single GSW to the abdomen with profuse trauma. 1221 and 1226 arrived and the combined crews of 1212 and 1221 worked on the man until he was stable enough to transport to the hospital. While transporting, 1212 notified the Heartland Trauma Center to mobilize a trauma team. The man remains in critical condition. The call was cleared at 21:19. At 11:06 GEFD was dispatched to an automatic fire alarm within Gramble DNA Testing Inc. which is located at 4910 State Route 343, Unit 33. 1223 responded with 2 under the command of Captain Edward Kendall (Radio #1203). Upon arrival, 1203 reported a fire inside one of the large refrigeration units used to hold DNA samples. The fire was quickly extinguished with only minimal damage to the surrounding area. 1223 was clear from the scene by 11:49. At 19:53 GEFD was dispatched for a medical local at 1743 Porter Avenue, a known hoarder's residence. 1212 and 1213 responded with 5 under the command of Captain Curtis Stallings (Radio # 1201). Upon arrival, 1201 reported that there was no clear way through the front door. One member of 1213's crew was able to climb through a side window to make patient contact while the other members of 1213's crew cleared a pathway to the back room. After the path was made, 1212's crew was easily able to get the patient on the cot and remove him from the building. 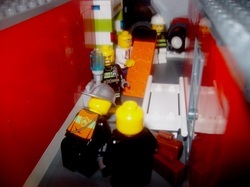 1212 transported him to Eaglebrick General hospital for chest pain. 1213 returned to quarters. The call was cleared at 20:49. At 14:32 GEFD was dispatched to 2702 Jackson Road for a turkey fryer fire with extension to the structure. 1223, 1213 (retired), 1226 and 1200 responded with 6 under the command of Chief William Black (Radio #1200). Upon arrival, 1213 reported a working fire with extension to the one wall. 1213's crew began the initial attack with their booster reel while 1223 and 1226's crews drafted water to supply 1213. The fire was extinguished quickly but the damage to one wall was extensive. All units were clear of the scene by 15:00. At 09:26 GEFD dispatch was notified via Sheriff's Office helicopter about a brush fire that was working its way through Eaglebrick State Park. "B" shift was recalled to the station to make sure every vehicle was staffed. 1227 and 1216 responded with 3 under the command of Chief William Black (Radio #1200). The combined crews of 1227 and 1216 worked their way down the main park road and found a small pocket of fire in one of the many open fields within the park. Further in park, at 10:02, a walking pedestrian phoned in a working fire in one of the historical structures in the park that had been caused by a pocket of fire in the brush. 1214, 1715 (Brickland Heights Independent Fire District) and 1226 responded with 7 under the command of Captain Edward Kendall (Radio #1203). Upon 1214's arrival, they found the structure fully involved with small pockets of fire around the building. 1214's crew advanced 1 line to the structure. 1715 tied into 1214 and 1223's crew pulled 1 line to the fire on the east side of the structure. 1227 arrived on scene and pulled a 3rd line to the west side of the structure. Just outside of the park, at 10:54, a man was cutting the grass in his sheep pasture when the brush fire overtook him and engulfed the field. 1224 and 1212 responded with 5 under the command of Captain Daniel Barrett (Radio #1202). Upon arrival, 1202 reported a working field fire. 1224's crew advanced 1 attack line into the field to protect the paramedics while they removed the victim and transported him to Heartland Trauma Center. After the victim was removed, 1224 extinguished the main pocket of fire. By this time (14:37), 1226 had been back to the station to pick up the department's boat in case they had to get to the far side of the Blackbrick Reservoir in a hurry. At 14:38, GEFD was notified by S.O. helicopter of a man struggling to keep his head out of the water in the reservoir. 1227, 1226 and 1216 responded with 4 under the command of 1200. Upon arrival, 1 boat was put into the water with a crew of 2. The crew pulled the man out of the water and returned him to dry ground, to be looked over by the paramedic in 1216. 1221 arrived and transported the man to Heartland Trauma Center. After the man was transported, 1216 reported 1 last pocket of fire, just south of the water rescue's location. 1227 arrived and began to draft from the reservoir because their tank was empty. They advanced 1 line and extinguished the remaining fire. The incident was closed at 15:49. 1227 (retired) and 1216 at the initial call out location. Rescuing the man from the reservoir. (Retired) 1227's crew making one final attack on the fire. At 10:41 GEFD was dispatched to a working structure fire at 9045 E. Deer Park Road. 1213 and 1216 responded with 4 under the command of Chief William Black (Radio #1200). Upon arrival, 1213 reported a working structure fire. 1216 arrived and 1200 took command. 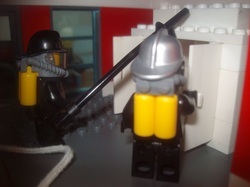 1213's crew was charged with interior attack. They advanced two 2 1/2" attack lines into the structure. At 10:57 1200 called general alarm for man power to the scene. 1223 responded with 3 under the command of Firefighter Marcus Trufant (Radio #1254). 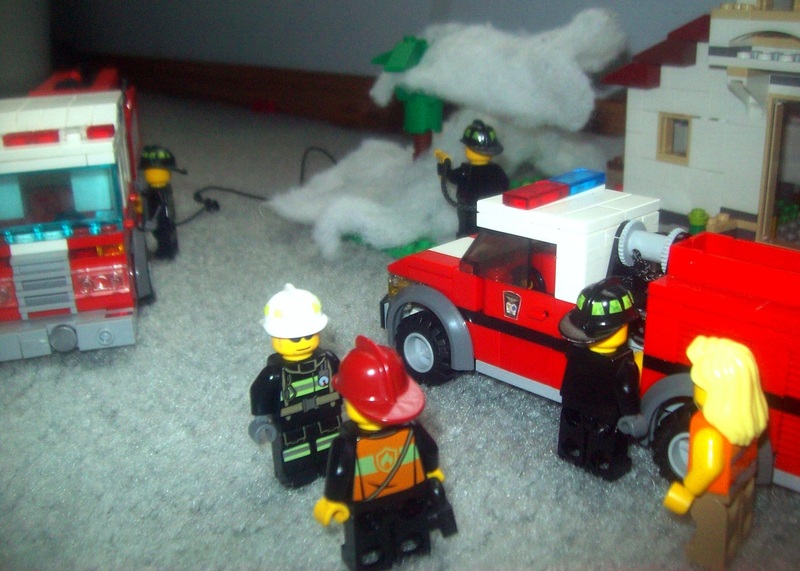 1223's crew was charged with venting the roof. All interior crews were pulled out because of a partial roof collapse that led to a full structural collapse. The fire was extinguished by 12:30. The cause of the fire was ruled to be arson. This fire makes 2 arson fires in same vicinity in consecutive days. At 11:33 GEFD was dispatched to a report of smoke in the area of E. Deer Park Road and Hampton Blvd. Because the area only has a small number of hydrants, 1223, 1216 and 1213 responded with 6 under the command of Chief William Black (Radio #1200). 1216 was already in the vicinity and arrived on scene at 9043 E. Deer Park Road and 1200 reported a working fire in an unfinished structure. 1213 and 1223 continued their response. 1213 was able to tie into a hydrant and make the initial attack. Since the structure was unfinished, they cancelled the other responding units and focused on keeping the adjacent structure from catching fire. The fire was declared out at 12:02 and all units were clear from the scene by 12:30. 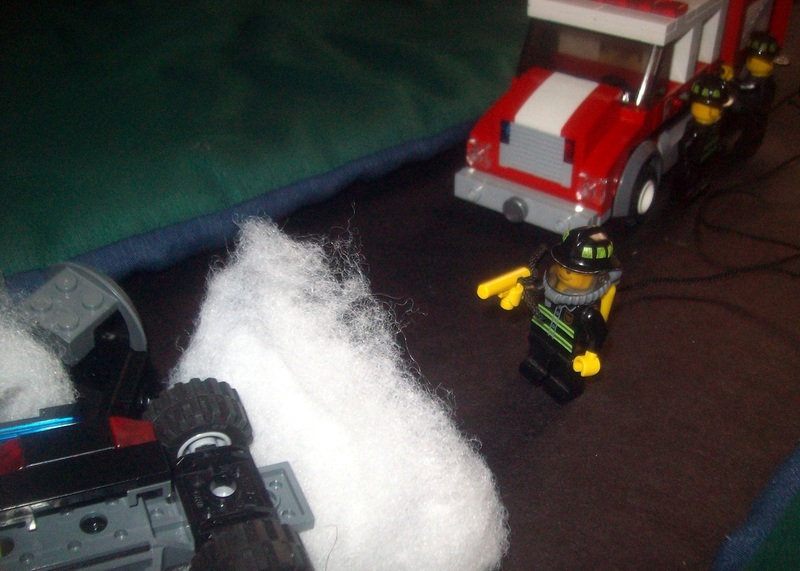 Upon investigation, the cause of the fire was ruled to be arson. The fire investigator is working closely with the police department to gather evidence and investigate further. At 16:01 GEFD was dispatched to a working structure fire at 2736 Cascades Blvd. 1213 and 1216 responded with 4 under the command of Chief William Black (Radio #1200). Upon arrival, 1200 confirmed a working fire. A general alarm was called for man power to the scene which brought 1233 with 2, 1212 with 2 and 1219 with 4. 1213's crew made entry. They began to extinguish the fire and found the property owner on the primary search, 1233's crew brought the victim out of the building. He was transported to Heartland Trauma Center with smoke inhalation and 2nd degree burns. He is in stable condition. 1213 tied into 1219 and vented the building. The fire was extinguished within an hour of 1213's arrival. The building was considered a total loss. 1223's crew extricating the victim. At 16:36 GEFD was dispatched to a roof collapse at 4728 Cascades Blvd. Suite 2. 1212 and 1223 responded with 4 under the command of Lt. Jackson Stallings (Radio #1206). Upon arrival, crews found that a man was trapped under a small piece of the roof had collapsed due to heavy storms in the area. 1223's crew extricated the victim from the roof pieces. 1212's crew then transported him to Eaglebrick General, where he was admitted for internal injuries. All units were in service within an hour of the initial dispatch. Overhead shot of the scene. At 14:42 GEFD was dispatched to a reported structure fire at 2721 Jackson Road. 1224 responded with a callback crew of 5 (the duty crew was already out on a car fire). Upon arrival, Capt. Curtis Stallings (Radio #1201) confirmed a working structure fire. 1224's crew began an attack. 1213 and 1216 cleared from the car fire and responded with 4. 1226 responded with 3 from the station. 1212 responded from the station with the day's EMS crew. 1213 arrived and began exterior operations with 1224's crew. 1212's crew stood by down the street. Chief David Boston (Radio #1200) took command. He diverted all auto aid rigs to the station for coverage. 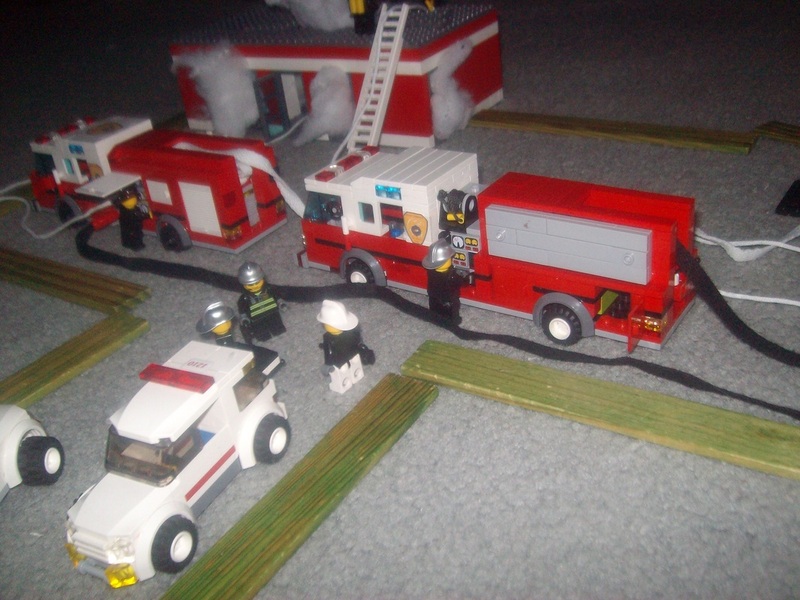 Brickfield 2319, 2313 and White Ridge Medic 2 covered station 1210. The cause of the fire was an electrical short in a piece of woodworking machinery. The owner of the shop didn't make it out before the fire had spread too far and was found DOA by firefighters during the secondary search.